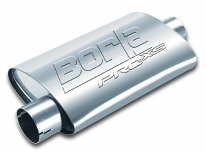 This muffler is reversible. You can mount it with the center inlet, offset outlet or turn it around and mount it offset inlet and center outlet. 14" x 4.25" x 7.88"